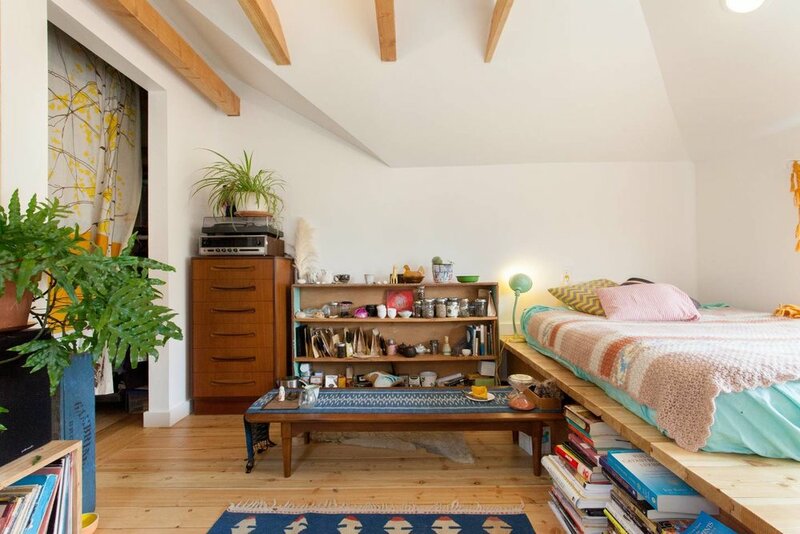 - Add space that can act as guest quarters, studio space, or as a rental. - Create additional rental income on an existing rental property. - Provide a new residence for the owner to live in so that the main house can be rented. - Create space for parents or adult children for a multi-generational living arrangement. ADUs can be a separate building (detached) or they can be a part of the main house (attached) either as a self sufficient addition or by subdividing part of the existing house to create an ADU (often an attic space or basement, for example). 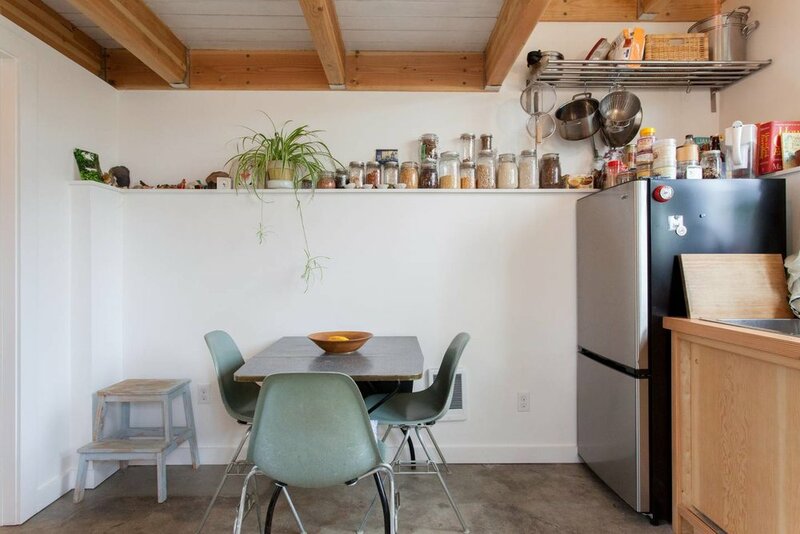 Existing garages can also often be converted into ADUs. See our guide to ADU resources. We also design small accessory structures which don't qualify as ADUs. These can be art studios, guest houses or flex spaces. 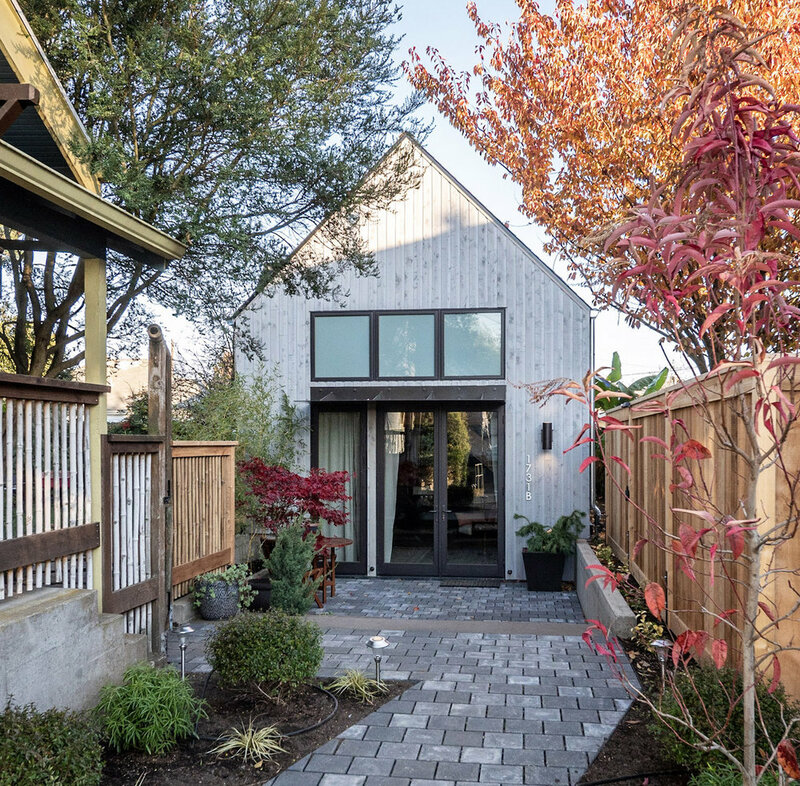 A new backyard ADU that takes a little different approach to achieving a small footprint. The ADU makes use of the ability to build within the required setbacks. This section of the code has strict height restrictions so the ADU has been sunken to allow for two full stories. This maximizes the amount of yard space and minimizes the building footprint. 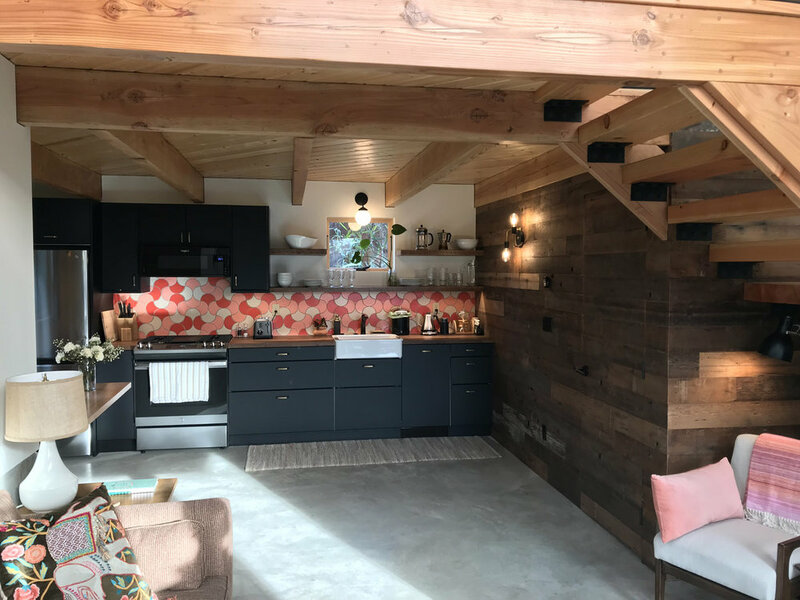 The ADU features concrete floors, juniper siding from Northwest Sustainable Wood, exposed structural wood decking and accent walls made from wood which was reclaimed from the former garage on site. This ADU lies within the City of Portland’s Woodlawn Conservation District and required conformance with the City’s Community Design Standards. 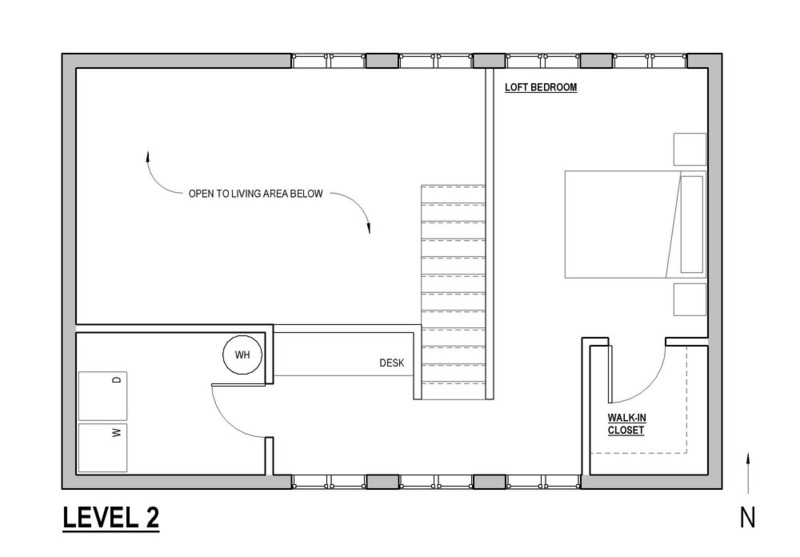 The ADU features ground floor living areas with bedroom and bathroom upstairs in an open loft. The warmth of the wood throughout, along with the concrete floors, ample light and openness provide an backyard oasis. 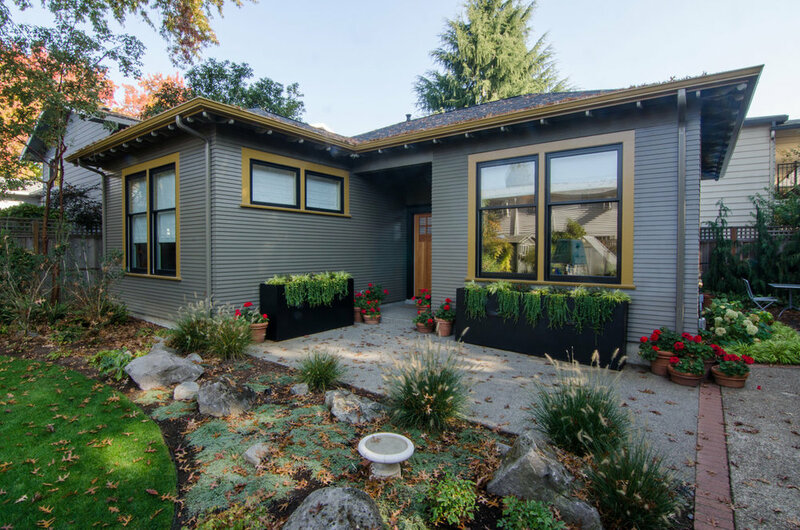 This ADU lies within the City of Portland’s Irvington Historic District and was required to be approved through the Design Review process. The ADU was constructed to allow three generations to live together on the property. It is all on a single level to allow for the ability to age-in-place. It contains two bedrooms and one and a half baths. The detailing of the ADU matches the main house which is considered a historic resource. 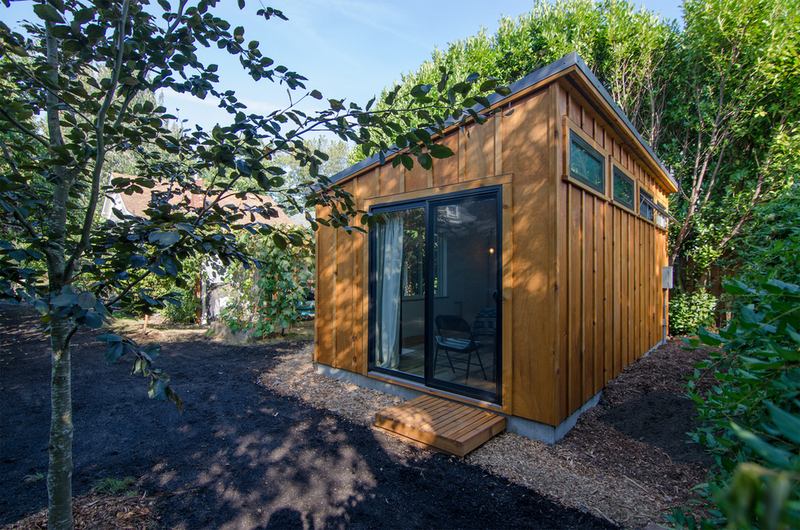 This owner occupied ADU was created for a couple who wanted to be able to live in a space fitted to their lifestyle. The ADU also allowed them to rent out the main house on the property. 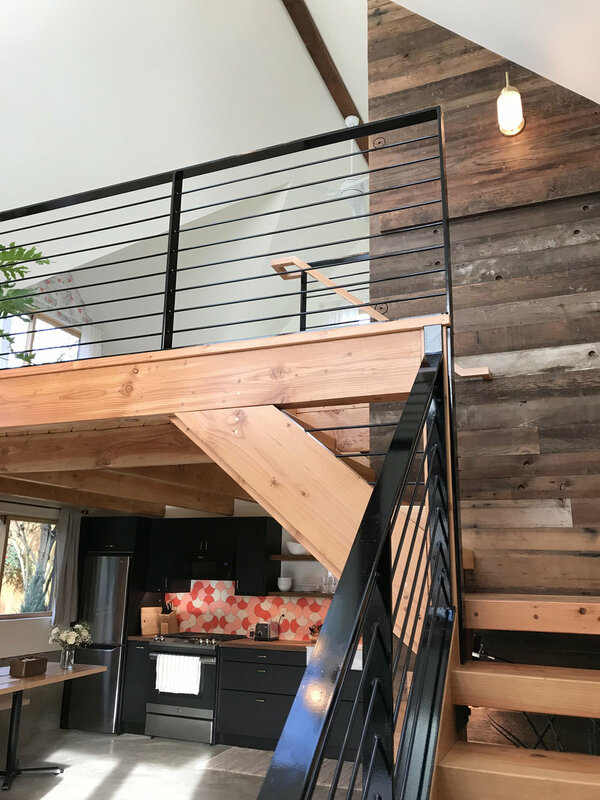 Some features of the ADU include a utility room, office nook at the upper stair landing and lower stair landing which doubles as a bench for the entry. 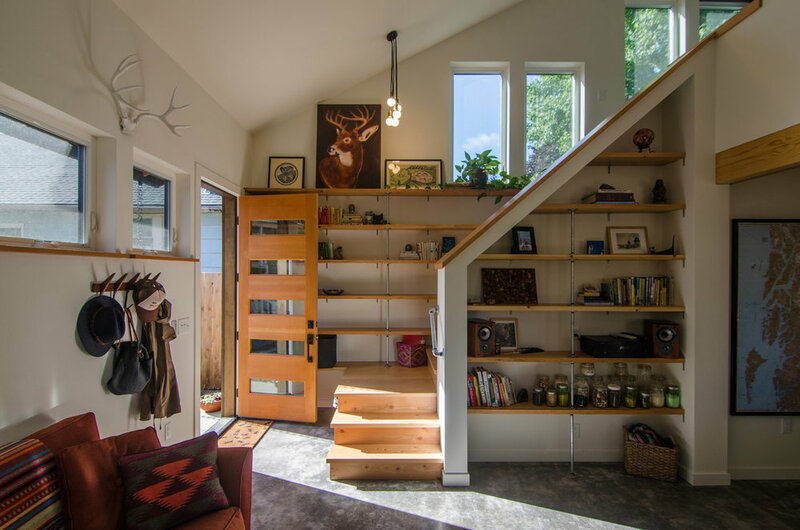 The stair way also doubles as a library with integrated shelving. 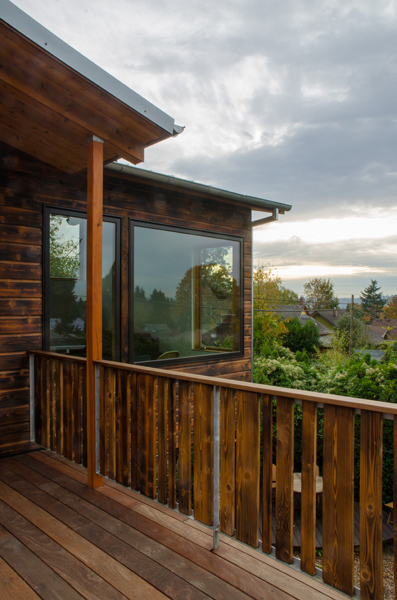 The exterior of the ADU is clad in stained cedar lap siding. This project aimed to transform a dark attached garage into a light-filled, fully functional, ADU. There were many constraints on this project the greatest of which was the extremely limited size. Through a focus on natural and exposed structural materials, the design strove to make use of all possibly available space. 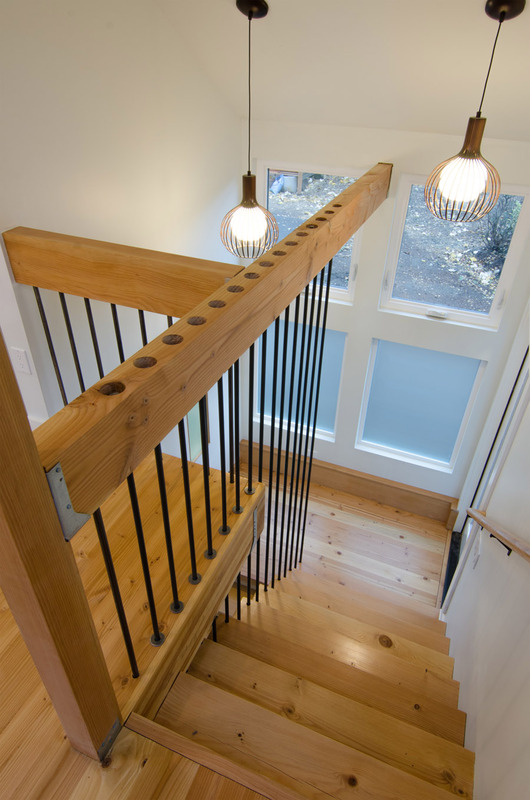 The stair had to be a very transparent element in order to maximize southern light in the lower floor. This ADU is part of a whole lot redevelopment which includes a new custom home developed at the same time. The homeowners were looking for maximum flexibility so the ground floor can function as an age-in-place suite. 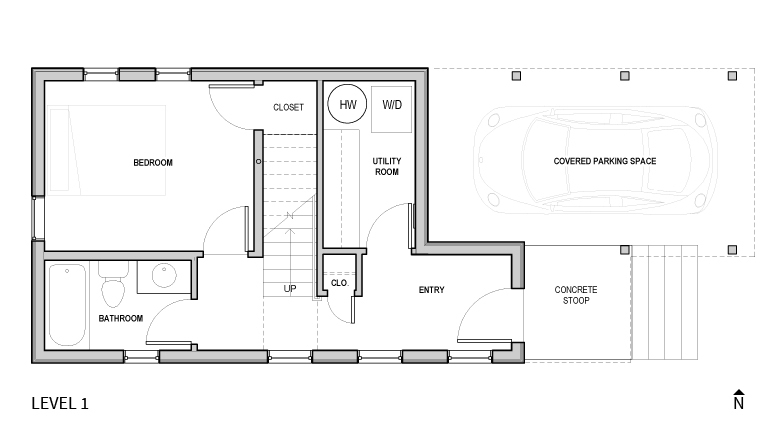 After wrapping up our Liberty St ADU project, a neighboring homeowner with a similar garage configuration approached us. The result is our Liberty St Ver. 2 ADU. While many elements are similar, site variations called for a slightly different approach. 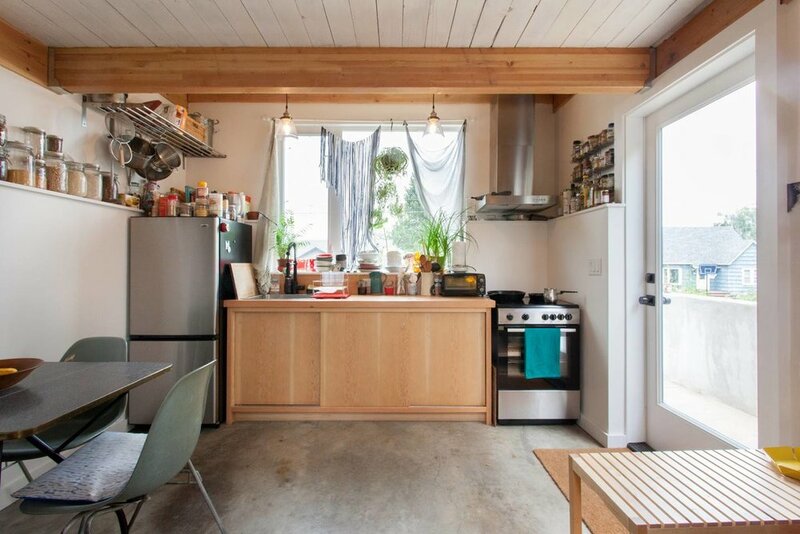 The kitchen is oriented to face the street providing an active connection between the space and the street. 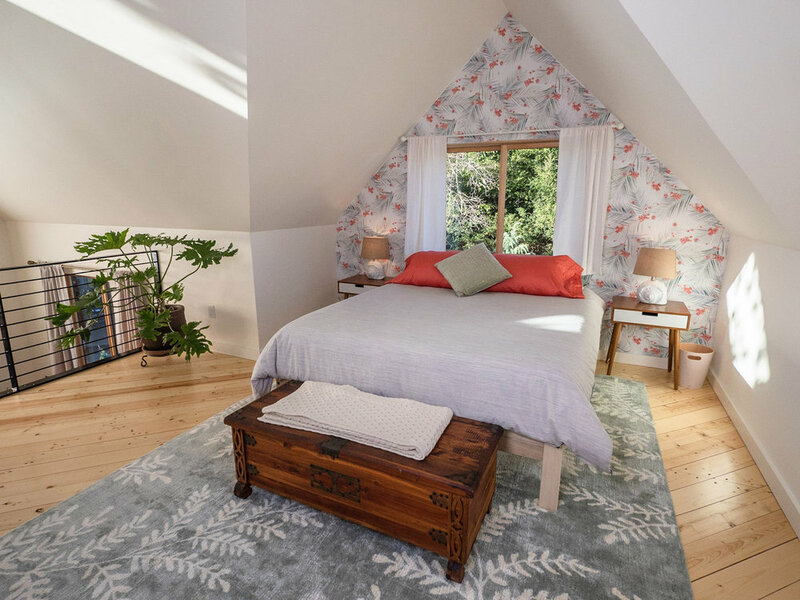 In an effort to make the best use of the limited space, we created a bed platform on the second floor which allows for higher ceiling and window heights on the lower floor. This new ADU replaces an existing storage garage and serves a number of functions. 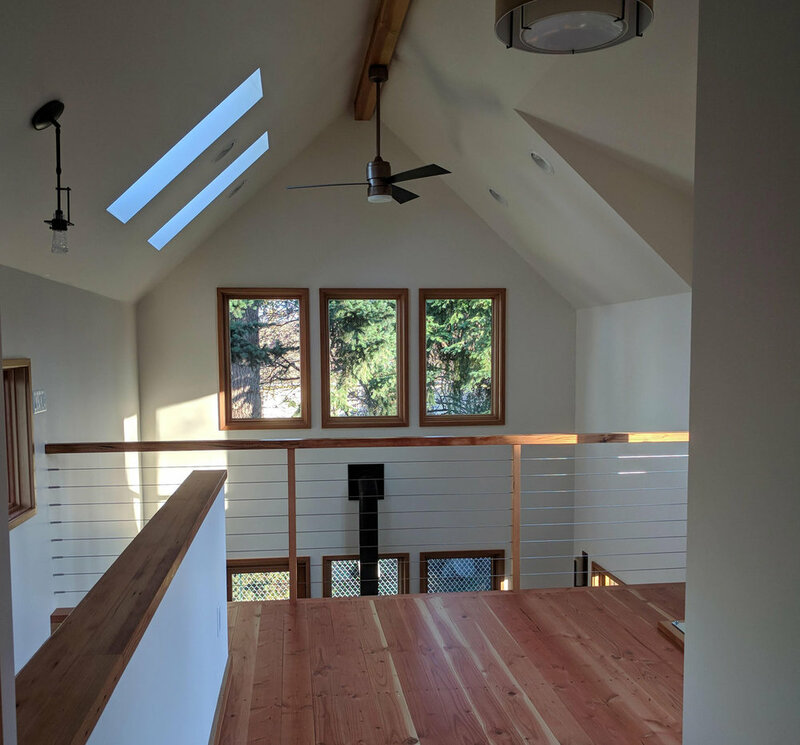 It provides a usable garage with large bike storage area and it creates a 2 bedroom 1.5 bath ADU with a roof deck which faces south and provides a private patio which completes an upstairs master suite. The ADU has a modern design language but works within the new guidelines for ADUs which do not match the existing house. 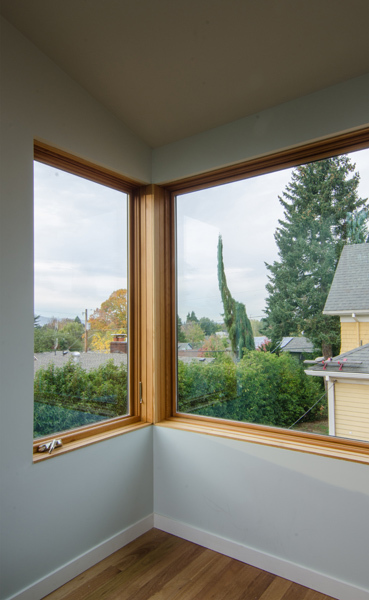 The ADU focuses on both the connection of indoor/outdoor space as well as natural light. This project involved a number of renovations to the existing house on the property but the keystone of the project was a new ADU. 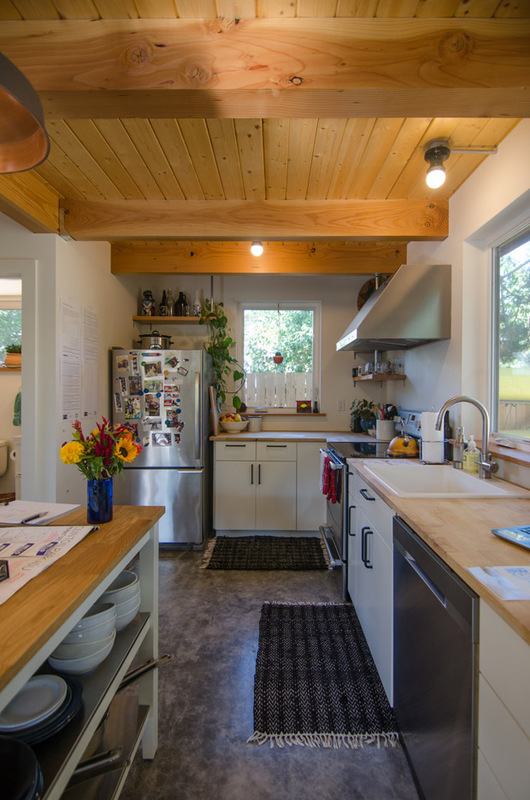 The ADU worked within the new City of Portland code which allows for ADUs and other accessory structures to sit within the required building setbacks. The design prioritized flexibility of the space for future uses and a palette of natural materials including ground faced CMU, a green roof, exposed wood beams and stained wood siding. This new building houses a wood shop/garage at ground level and a studio and roof deck above. The building has been split into two forms to decrease the size of the building mass and also to create additional outdoor spaces above and below the forms. The owners wanted a two story space in order to preserve limited backyard area but did not want an imposing two story structure that would dominate the rest of the yard space. The new structure and outdoor areas had to be tightly interwoven with the existing deck and yard to maximize the usefulness of the limited space. 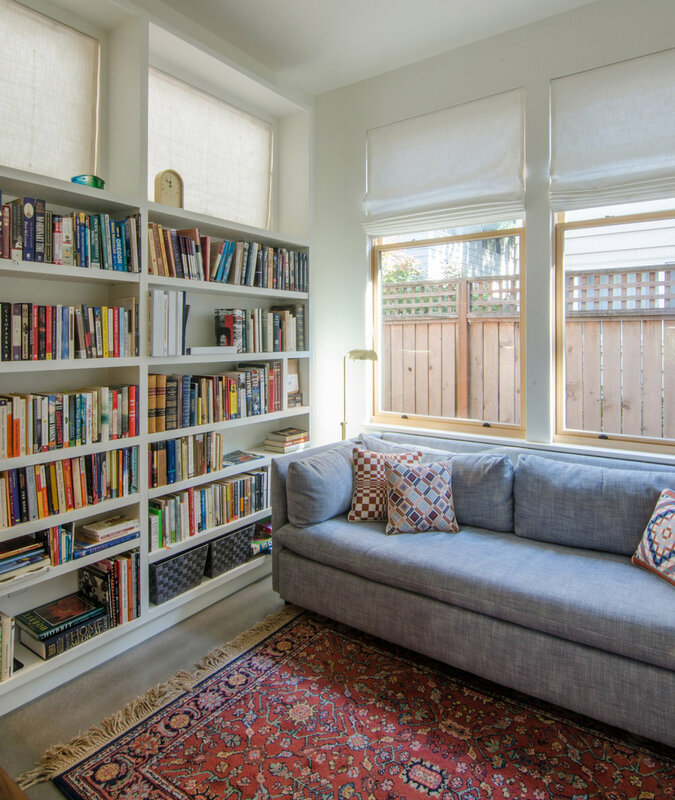 This quaint, backyard, detached addition will serve as a music studio, art space and guest sleeping quarters while preserving as much of the existing backyard and gardens as possible. 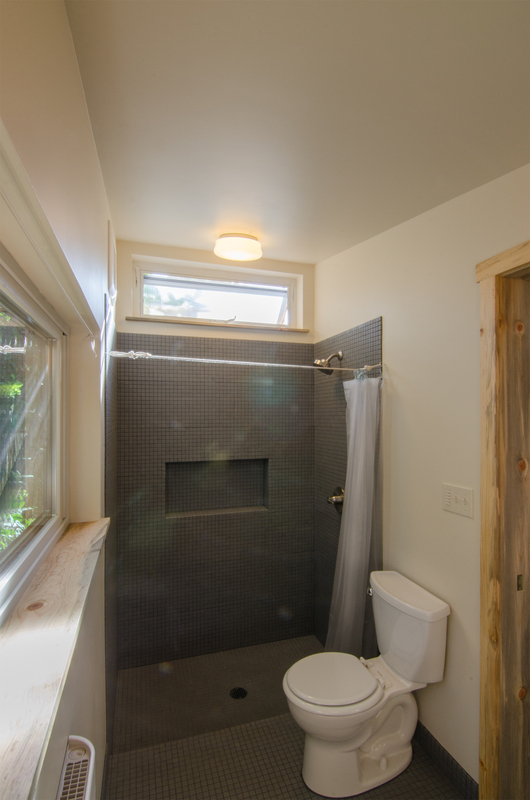 It has a compact but full bathroom, making this a highly flexible and functional addition to this cozy, NE Portland home. You can stay over in this project by booking through Air BnB. 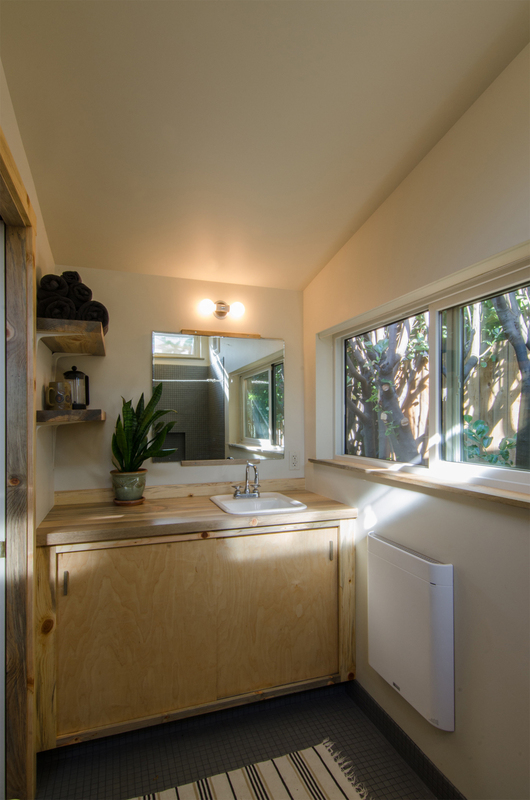 Check out the "Eco City Cabin" on Air BnB. The client for this project wanted to build a space for himself behind an existing rental house that he owns. The ADU consists of a bedroom, bathroom, and office lofted over a open kitchen and living space. There is also a large bike storage and repair area attached. The design focuses on openness, ample day light and exposing structural materials such as the polished concrete slab and exposed wood beams and decking of the loft which doubles as the ceiling over the kitchen. The Concordia ADU is a 1 bedroom, 1 bath ADU built on a small footprint. It has an open plan ground floor with double height ceilings that open to the stairs and loft bedroom. The project is small but went to two stories in order to maximize yard area and capture views of Mt. St. Helens. A key to this project was proper siting to allow the project the possibility of being rented out without sacrificing the privacy of the main house. You can stay over in this project by booking through Air BnB. Check out "Casa Paloma" on Air BnB's website. The client for this project came to us wanting to turn a dilapidated garage into an ADU to use as their primary residence and rent out the main house on the property. Polyphon was tasked with refurbishing the existing CMU structure and coming up with a layout which maximized natural light despite two of the building walls being prohibited from having windows due to code issues. The finished project features a stained concrete floor, reclaimed wood trim salvaged from the remodel and original finishes throughout. This ADU will supplement an existing rental property and replaces an existing, underused, single-car garage. Roughly occupying the same location and footprint as the old garage, the new ADU will be a two-bedroom, one-bath home with covered parking. Above the covered parking space is an elevated deck to provide outdoor space for the tenants that is separate from the existing yard. The design makes use of abundant southern solar exposure and is heated by a ductless heat pump system. This project was featured on the 2nd Annual Portland ADU tour on the 30th of May, 2015. There are many challenges to with using shipping containers for residential uses. This design tries to maximize the inherent strengths of the containers while creating open and flexible spaces. The project also aims to highlight the reuse of the containers while providing a tight and efficient building envelope. 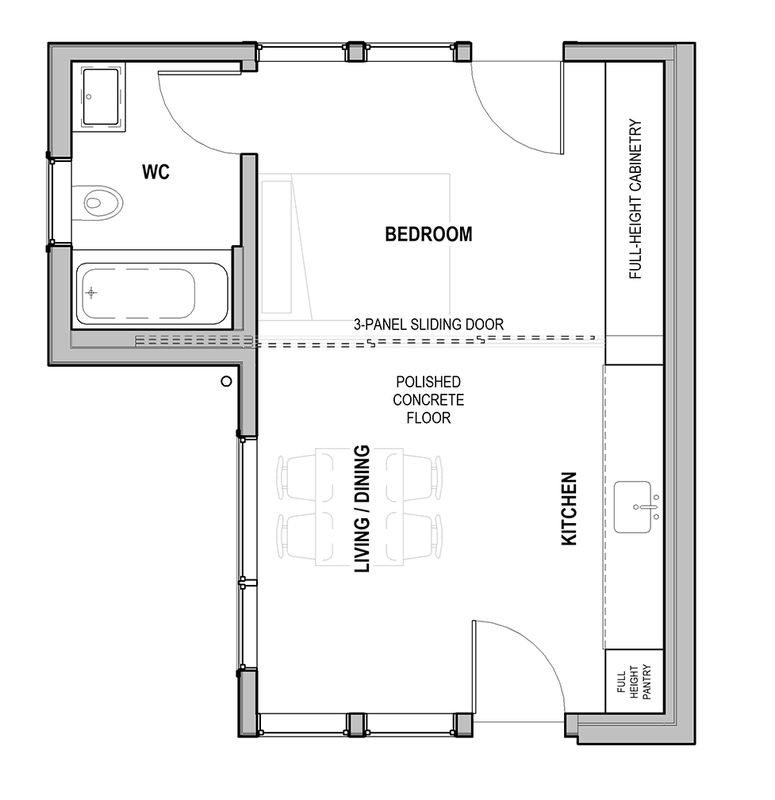 The project is a two bedroom, 1 bathroom configuration with the option of opening the second bedroom to the living space to provide more openness. This project is a proposed new ADU with separate bike storage, located in the Piedmont Conservation District of N/NE Portland. Project goals include minimizing the building footprint to conserve yard area, engaging the paved alleyway at the back of the lot while maintaining privacy, and orienting the project to maximize sun exposure while respecting the privacy of the main house and yard. The bike storage is located in a separate building with a planted roof. A covered entry-way connecting the ADU to the bike storage acts as an intermediate zone between the yard and the alley and doubles as a deck off of the 2nd floor bedroom. The ADU will have two bedrooms, one bathroom and an open floor plan kitchen and living area which opens up to the yard. 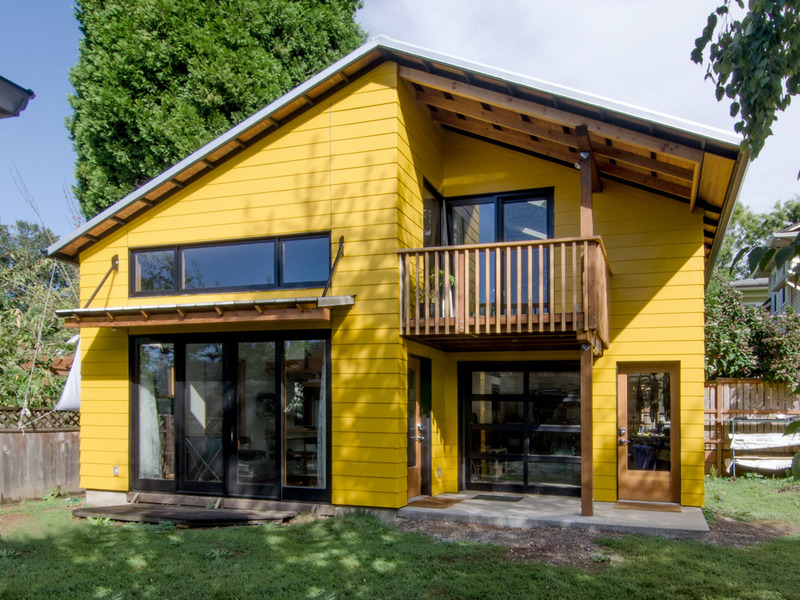 This ADU was developed under a different model than typical ADUs. The owner is local sustainable developer Eli Spevak of Orange Splott LLC. 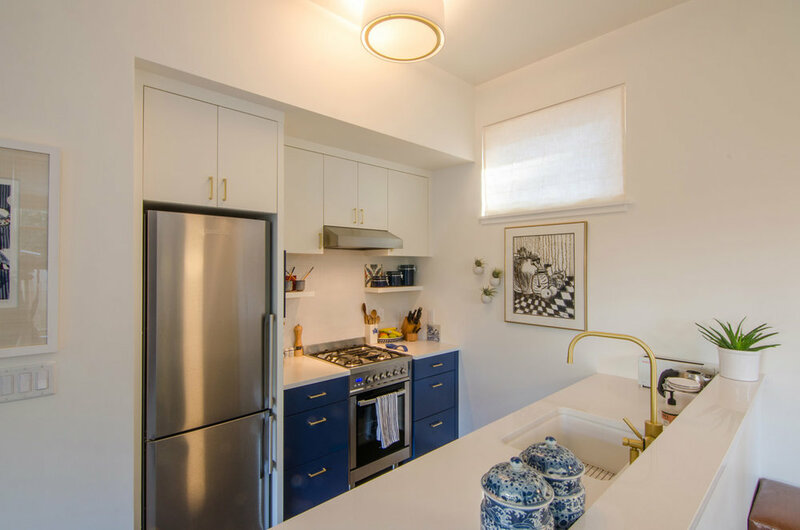 The ADU and existing house were created as condos and sold separately as a way to provide, increasingly rare, small scale housing stock as well as a micro community within the neighborhood. With many nods to the existing house, the ADU has a strong street presence and is oriented for light and orientation to communal gardens and gathering areas. This little house was designed as a mother-in-law unit for a real live mother-in-law. Compact and efficient spaces paired with rich, reclaimed materials lend this small space expansiveness but also privacy. This ADU project is to be the new home for a family member of the main house. This design boasts a highly efficient layout, with an open kitchen & living room, bathroom and office on the first floor; and second floor bedroom which is open to the lofted living space below. Large windows on the southern facade provide abundant natural daylight into the lofted living space. Patio doors off of the main living space open to the backyard, extending the living room into the outdoors. A side porch provides shelter over the main entrance and acts as a buffer between the new ADU and the existing house. 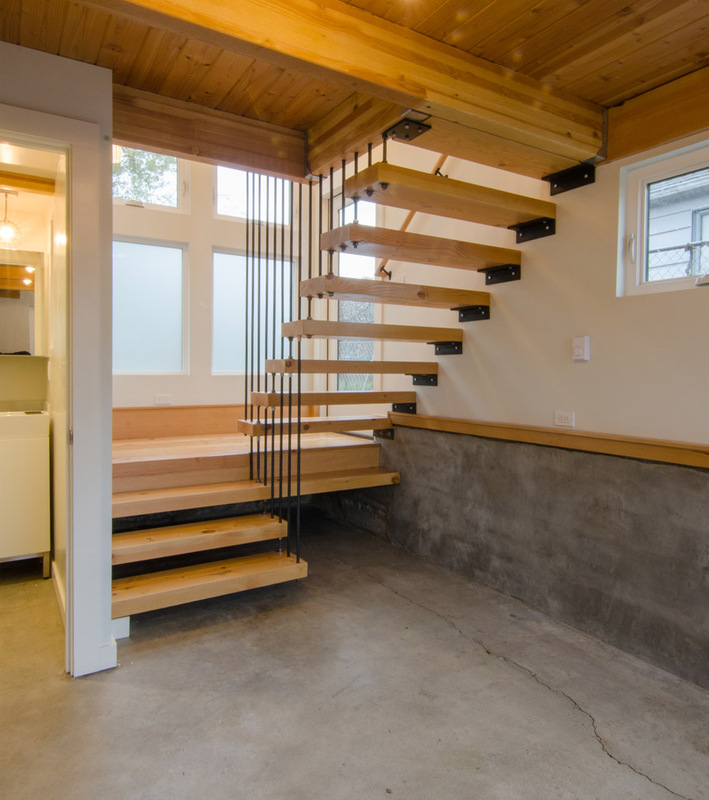 This garage to ADU conversion is being completed to Energy Star NW standards, turning an under-utilized garage into a two-bedroom, light-filled space that is activating one of the many unfrequented alley's of NE Portland. Radiant floor heating, sliding translucent glass doors and a full energy retrofit are part of this conversion.